It is being reported by a few sites that Jay-Z and Coldplay are being paid $1 million each for performing at The Cosmopolitan's new year's eve grand opening bash. The total budget for the party is being rumored at $25 million. I guess when you've spent $4 billion dollars on a hotel another $25 million isn't a big deal. Especially considering that Cosmo's "soft" opening was rather understated with no fireworks or any of that jazz. Chef José Andrés talks about his new restaurants Jaleo and China Poblano in this new video from The Cosmopolitan. A new Irish pub will be opening on the Las Vegas Strip. 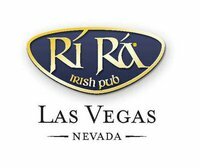 Rí Rá Irish Pub is scheduled to open in March 2011 and will be located at The Shoppes at Mandalay Place. A key component of the restaurant will be a 160 year old, eight foot tall, 500 pound statue of St. Patrick that is currently being shipped over from Ireland. The pub will also feature live music and a comprehensive drink list. For more information and updates about the new bar, check out Rí Rá Irish Pub on Facebook. I just found this video room review of The Cosmopolitan of Las Vegas on YouTube. The video does a pretty good job of showing off one of the wraparound suites at the hotel. When The Cosmopolitan was originally conceived, a great portion of the units were intended to be sold a condos. From this video it's clear that much of that condo influence remained in the design of the suites. It's pretty rare in a Vegas hotel room to get a full sized fridge, kitchen and washer and dryer (not pictured in this video, but included in most of the suites). These added amenities will no doubt come in handy to Cosmo guests. One of the unique features at Cosmopolitan is the graffiti artwork on the walls of the parking garage. Here are some videos that Cosmo released profiling some of the artists. Cloud Nine - the balloon ride attraction near Mandalay Bay has closed again, and this time it looks to be permanent. Cloud Nine opened about a year ago and operated for about six months before it was forced to close because of damage caused by high winds. The attraction recently re-opened but apparently didn't draw enough interest to continue operations. "The Cloud Nine Balloon Ride in Las Vegas has closed is no longer in operation. We want to thank the thousands of customers who had the opportunity to fly with us over the skies of Las Vegas. We bid you a fond farewell." The balloon was an interesting concept, but there were many pitfalls surrounding the project. High wind days made for an uncomfortable ride, if they were even able to take off at all. The cost and location also might have been drawbacks. In the end I think most people prefer to take in a view of the Strip from a high floor in an enclosed building. 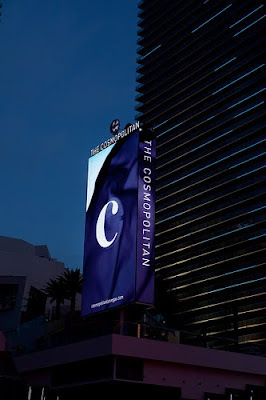 After over five years of construction, and after the property was foreclosed upon by eventual owner Deutsche Bank, The Cosmopolitan of Las Vegas opened to the public last night. The opening seemed to have gone pretty smoothly. Big time VIP's were in the house including Steve Wynn, and Jim Murren. Brandon Flowers performed a few songs and party goers drank and gambled the night away. There were a few accounts of hotel rooms not being ready on time, confusing parking garage signage and the music being too loud in the casino. Nothing too tragic for an opening of this size and scope. It's great to see Cosmo open. Now it's on to the next major hotel opening in Las Vegas. Fontaine... never mind. Many people will be looking forward to the year 2012 in downtown Las Vegas. Three new developments opening around the same time are expected to spark an economic boom of sorts near Fremont Street. A new City Hall is being built, which should be done by 2012. The old City Hall building will then be occupied by online retailer Zappos.com, which has agreed to lease the property for at least 10 years. The Zappos move will bring 1000 employees to the area. Around the same time as the City Hall switch, Lady Luck should be re-opening. The owners held a press conference this week re-affirming plans to remodel and open the property in 2012 under a different name. It's nice to see some good news for downtown, even though it's over a year away. I had my doubts about Lady Luck, but the City Hall and Zappos development makes the whole area more attractive, which should give the Lady Luck owners some incentive to open the property. A unique feature at Cosmopolitan is their Art-o-mat vending machines. These restored cigarette vending machines will allow visitors to purchase small pieces of original, signed artwork. I heard the price was going to be $5.00, but some of these pictures of the machines going into Cosmopolitan say $20.00. I'm guessing different machines and items will have different prices. 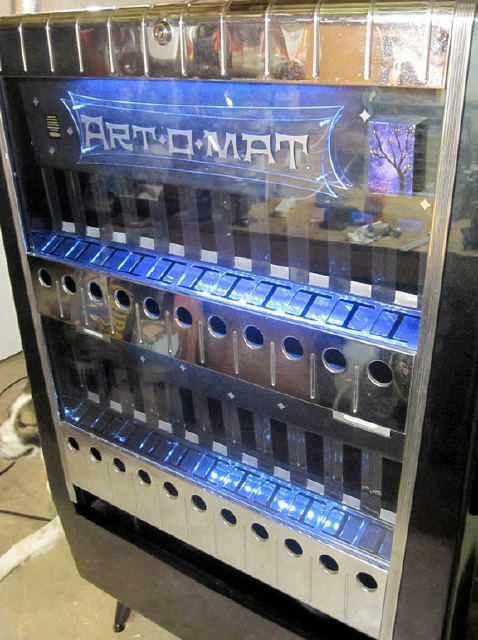 The machines look pretty cool and I think they'll be popular amongst the artsy Cosmo crowd. Gordon Ramsay Restaurant in Paris De-Theme? 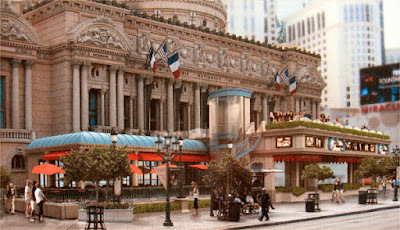 Gordan Ramsay will be opening a new restaurant at Paris Las Vegas in 2011. Robin Leach is reporting that Gordon Ramsay Steakhouse will replace Les Artistes, which will be closing. "I think you will see Caesars slowly taking away the French overtones of the Paris with these moves. Obviously, with the Tour Eiffel right there in the casino, you can’t ignore the French theme. But ‘les directions’ will become the directions in every way, and the staff will slowly phase out the French-language greetings." This is an interesting move. It certainly has been a trend in Las Vegas to remove the overt themes from the resorts, but I don't know if that has been a popular move with tourists. As "tacky" as the themes may be, a lot of people still like them. I think if you're going to have a themed resort it's better to go all out with the theme than to go half way with it. Have you always wanted a Total Rewards Diamond Card, but didn't want to gamble the required amount to get one? Now you can buy Diamond Card status by purchasing a special "Ultimate Holiday Gift" package for a stay at Caesars Palace, Paris or Planet Hollywood. Packages start at $699 and include 2 nights, limo to and from the airport, $200 food and beverage credit and Diamond Card status throughout your stay. You also get a private trip concierge to help you book the trip. This package is meant to be given as a gift, so I presume it would work similarly to a gift card. You give someone the gift, then they call the private trip concierge and book the package. If you can use this package on a weekend (I didn't see anything that said you can't, although the fine print says "Subject to availability. Blackout dates apply.") it might be a pretty good deal. Let's use Paris as an example at $719. The package gives you a Red Room, which on average could run you around $500 for the weekend. Add the food credit and limo and you are getting $750 worth of stuff for $719, plus the perks of a Diamond Card. It might be a bit of a splurge for the low rollers out there, but I think it could be worth it to get some VIP Diamond Card treatment for a weekend. Check out Caesars Total Experiences for details. NOTE: The package is advertised as "Only available for the holidays." Cosmopolitan opens one week from today. While browsing the internet this morning I noticed a series of new advertisements that caught my eye. 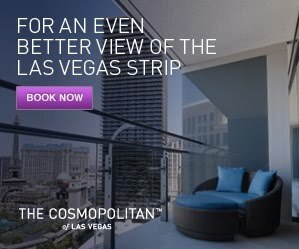 The new series of ads showcase some of the unique packages that Cosmo has to offer, along with one that shows off the terrace rooms. The "Nightcap Breakfast" package, which includes a $40 credit at Wicked Spoon Buffet. The "Room for Three" package allows three adults to stay in a room without paying the extra occupancy fee. The "Raid the Minibar" package allows guests to consume all edible & drinkable contents of the minibar during the length of their stay. The world famous Donny and Marie wrap on the Flamingo is coming down and will be replaced with an advertisement for the new H&M store at the Forum Shops. While the Donny and Marie wrap was definitely tacky and a bit of an eyesore, at least hit had something to do with Las Vegas and more specifically the Flamingo. An H&M advertisement seems kind of bland for that kind of strip frontage, and the store it's promoting is across the street at Caesars, which might confuse some pedestrians. The preferred option would be not to have billboard advertising on the front of hotels, but it looks like they are here to stay, at least at Flamingo. If they insist on wraps, something like the Love advertisement at Mirage isn't too bad, it's fairly unobtrusive and understated. 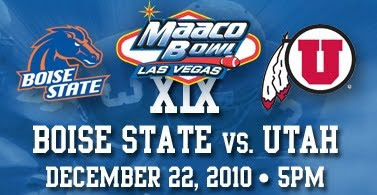 College football fans in Las Vegas will be pleased at this years match-up of Boise State and Utah in the MAACO Bowl Las Vegas on December 22, 2010. Both teams were very highly ranked throughout the season before suffering late season setbacks. I'm guessing the game will sellout and bring in a good amount of out of town visitors, which is good news for the local hotels and casinos. New Year's Eve is four weeks from today, which got me wondering about hotel rates for one of the biggest nights in Vegas. The best deals can usually be found by using players cards, comps, etc. but for this discussion I will be looking at Expedia rack rates. If you don't see a hotel listed below it is most likely sold out. Tropicana looks like the best deal on the strip. For less than the price of Imperial Palace you can get a newly remodeled room at the Trop. For the ultra-cheap bargain rooms on the Strip, I would probably pick Sahara over Circus Circus and Riviera. The Riv's rooms are nicer but Sahara is $20 a night cheaper and has monorail access. Mid-range properties Luxor and Excalibur don't look too bad at $190 a night, although the aforementioned Tropicana might be a better deal for essentially the same price. For a center strip location you could go with Flamingo, Bally's, Harrah's or TI for around $235, or Planet Hollywood for slightly more at $279. Most of the high end properties seem to be generally in the same price range, so personal preference would be the deciding factor. If you are staying at one of the high end places a $50 price difference probably isn't going to influence your decision. For the young hip crowd, Hard Rock at $207 seems like a better deal than Palms at $276. Downtown I think I would go with Golden Nugget. It is generally considered the best property downtown and for NYE it's roughly in the same price range as the other downtown hotels. If you have a car and want to stay away from the chaos on the Strip, bargains can be had. Red Rock, Green Valley Ranch and South Point are all under $150. Las Vegas Hilton also looks appealing at $180 with monorail access. King of Las Vegas Steve Wynn has reportedly proposed to girlfriend Andrea Hissom. "Andrea was thrilled when Steve proposed and that slid the ring on her finger in an old-fashioned way. They’d just finished an intimate candlelight dinner in a private room that the hotel mogul had planned in advance at Sinatra in his Encore. Frank’s music was even playing when he asked the British beauty for her hand in marriage." Source: Robin Leach / Las Vegas Weekly. Parabounce is a concept that allows people to bounce and fly around using their own individual helium balloons. 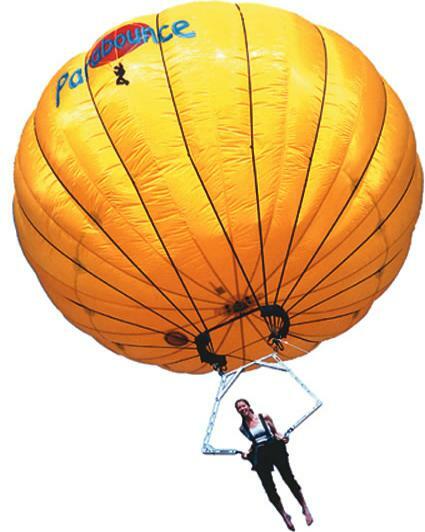 Las Vegas seems like the perfect place for an attraction like this, and so the Parabounce people are planning on opening a "100,000 square foot “bubble style” dome where up to 20 flyers can simultaneously float, soar and bounce in individual, 22-foot, Parabounce helium balloons." Source: Business Wire and Parabounce. Flamingo's Steakhouse 46 (named after the year Flamingo opened) has closed. Steakhouse 46 was probably Flamingo's most expensive and nicest restaurant. Without it Flamingo's dining options are becoming even more limited. Plenty of fast and casual places to grab a bite, but not much on the higher end. Fortunately there are plenty of steakhouses on the Strip so I doubt 46 will be missed that much, but losing its top restaurant will further hurt Flamingo's dining reputation. The Harrah's Entertainment name change to Caesars Entertainment is now complete. Harrahs.com is now redirected to Caesars.com with a short message about the name change. Other than that the website looks pretty much the same. For more information check out the Caesars Entertainment corporate site. Another new premium gourmet burger restaurant will be opening on the Las Vegas Strip. i♥burgers will be located in The Shoppes at the Palazzo. The burgers will hit the grill this winter. The concept seems fairly similar to the other burger joints in Vegas. Customers can choose from specialty burgers or can create their own. A mixologist will stir up some tasty beverages and shakes, and i♥burgers will even have its own "fry menu". When KGB was opening a few months ago at Harrah's I had wondered if the Las Vegas gourmet burger market was becoming a little too saturated. It looks like the answer is no, at least not yet. After all, almost everyone ♥'s a good burger. The Harmon Hotel is the one part of CityCenter that hasn't opened. Construction flaws caused the building to be capped at half the original size. Now the building is locked up in courts to determine if it is safe to complete, and who's to blame. MGM has been pretty quiet about the Harmon, but in their latest earnings release they concluded that "It is unlikely the Harmon will be completed using the building as it now stands." 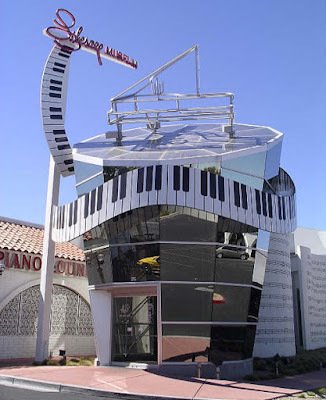 While nothing will be done anytime soon because of pending litigation and MGM's financial woes, it looks like the Harmon will eventually be knocked down and the space will be used for something more appealing. Rita Rudner will be moving from Harrah's to the Venetian starting in January 2011. Rudner has been working almost exclusively in Las Vegas for almost ten years starting in 2001 at New York New York. She moved to Harrah's in 2006. Rita Rudner is the biggest headliner at Harrah's so it will be interesting to see what they come up with to replace her. It seems likely they will move a show over from one of their other properties to fill the gap. Harrah's Entertainment will change their name to Caesars Entertainment. The name change will be a part of their upcoming IPO. Back when the company was taken private in 2008 this exact same name change was announced but never completed. I guess it makes sense to change the name of a struggling company, but I'm not sure it will really make that much of a difference in the grand scheme of things. They definitely want to take advantage of their flagship brand, and a name change to Caesars will certainly achieve this. Michael Jackson Cirque Show to Mandalay Bay? It was announced this week that the Lion King will be ending its run at Mandalay Bay in late 2011. This likely paves the way for the new Michael Jackson Cirque du Soleil show to take over the Lion King showroom in 2012. The Jackson show will be on the road touring in 2011 before settling into a permanent home in Las Vegas. Mandalay Bay has always made the most sense as the home for this show. It is clearly the best MGM Resorts property currently without a Cirque show. The Michael Jackson show will also include a themed nightclub, which could presumably be located in the closed Rumjungle space. Las Vegas Sands (owner of the Venetian and Palazzo) reported strong third quarter results today, including a 67% year over year increase in revenue that totaled $1.91 billion. Most of the success can be attributed to the company's Macau and Singapore operations, although Las Vegas seems to be doing marginally better as well. In March 2009 LVS stock was trading at under $2 a share. Today it closed over $41 a share, and in after hours trading it was as high as $45. Source: Las Vegas Sands - Press Release. 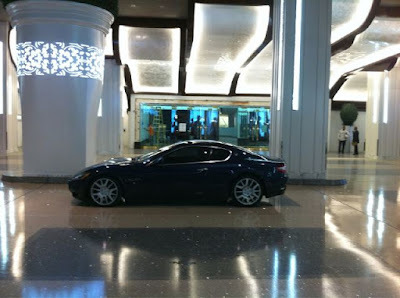 St. Regis at Palazzo Capped at 5 Floors? A recent Reuters article announced that the Venetian and Palazzo will join the portfolio of InterContinental Hotels Group. The group is best known for their Holiday Inn and Crowne Plaza brands. By joining forces with InterContinental Venetian and Palazzo will become part of the Priority Club program, which has 52 million members. While this is a nice development for the Las Vegas Sands properties, there was another item in the article that caught my eye. It appears that the Sands agreement to build St. Regis-branded condos in front of the Palazzo is close to expiring. Given the state of the Las Vegas condo market it's clear that LVS won't be building any condos if they don't have to. COO Michael Leven revealed that the building might be capped at the current five stories. "We might finish it off there to get rid of the eyesore." If the building is completed at five stories I wonder what they will use that space for. There is already a Walgreens on the ground level, and five floors probably isn't enough to be a separate hotel tower. Perhaps they will just complete the outside until they figure out what they want to do, similar to the Octavius tower at Caesars. Boyd Gaming announced today that it will not purchase the rest of the Borgata in Atlantic City. Borgata was a 50/50 joint venture between Boyd and MGM. Recently MGM announced that they had an offer on the table to sell their share of the property. That offer was made by Leonard Green & Partners. "Given other opportunities and our current focus on deleveraging our balance sheet, the current offer would not provide a sufficient return on investment for our shareholders. Despite this decision, we are confident in the future of Borgata. The property represents a major investment by Boyd Gaming, and it has delivered substantial value for our shareholders. We remain comfortable with our current position as managing member and 50% owner of Borgata, the region's premier destination resort." President Obama left Las Vegas yesterday. This video shows the motorcade as it made its way south on the Las Vegas Strip near the Welcome to Las Vegas sign with Mandalay Bay in the background. There was a power outage at the Golden Nugget on Thursday afternoon. The power went out at around 2:00 and was restored around 4:00. Customers were asked to leave the casino as the power outage shut down operations. It's pretty rare that an casino would be entirely closed by a power outage. We hear about outages from time to time, but usually generators kick in which allow the casinos to remain functional. I wonder how much revenue was lost by the Nugget during the dark period. Probably not a lot but every bit helps (or hurts) especially downtown. Source: AP via Washington Post. A few big events caught my eye that are going on in Vegas this weekend. President Obama coming to Las Vegas, making a quick visit staying over Friday night. Obama is campaigning for Harry Reid. Jimmy Buffett is having a concert at MGM Grand, and Margaritaville is having a "Street Party" before the concert. Justin Timberlake is hosting his golf tournament and will also be performing at Planet Hollywood on Saturday night along with a few special guests including P. Diddy. 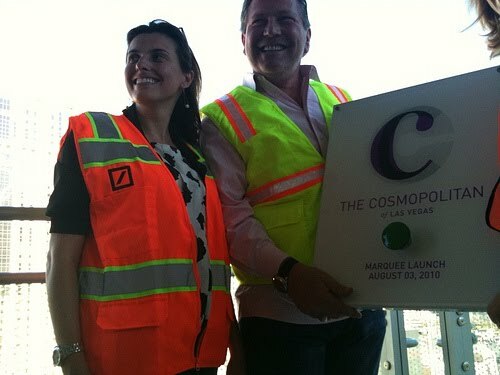 It was pretty much a formality, but Cosmopolitan officially got approval for their gaming license. The commission had some questions about the hotel's revenue projections, given that CityCenter's projections have come up short. I actually think that Cosmo is shaping up to have a more successful opening than CityCenter because of the better location and the prospects of an improving economy. Cosmopolitan today announced the retail stores that will be in the hotel. I'm not really familiar with any of these, which is probably a good thing for the Cosmopolitan because I don't know a thing about high end fashion. I'm sure these are exciting names people who are more informed though. Cosmo CEO John Unwin was quoted as saying that these shops were each "specifically curated" for the Cosmopolitan brand. Harrah's will be issuing an IPO that could raise up to $575 million. The cash will then be used to finish the mothballed Octavius Tower at Caesars Palace and to build the LINQ retail and entertainment area between Flamingo and O'Sheas. Both of these projects are long overdue and it's nice to see that they will be completed. Octavius Tower was scheduled to open in the summer of 2009 before it was put on hold in January of that year. Project LINQ was first envisioned in 2006. Since then there have been a few different ideas for the properties between Harrah's and Bill's. With the economy crashing, the more extravagant plans were scratched and LINQ was brought back to life. Along with the two Vegas projects, Harrah's will also use some of the IPO money to invest in and run some Ohio casinos with Dan Gilbert. The Cosmopolitan produced a 60-second TV commercial, which premiered on October 17th during the Mad Men finale. The ad is definitely strange. I'm guessing most of the TV audience was pretty confused as to what they just saw. That being said the ad is pretty unique and Ithink I like it. - A girl licking a plate. - Tightening a corset using a high heel as leverage. - An old woman dancing with a young man. - Some kind of photoshoot in a guest room. - A waiter walking through water to serve someone in a pool. - Various animals frolicking about the hotel. The songs are "Spread Your Love" by Black Rebel Motorcycle Club and "Doop-Doo-De-Doop (A Doodlin' Song)" by Blossom Dearie. "Just the Right Amount of Wrong" is the tag line at the end of the commercial, which reminded me of the Aria commercial with the "Words Will Fail You" tag line. The Aria ad was widely criticized for taking itself too seriously. I think Cosmo might have taken note of that and went in a somewhat different direction with the quirkiness of their commercial. Despite the differences both ads portray their hotels as ultra high-end with no mention of a casino to be found. MGM Resorts International is close to selling their 50% stake of the Borgata in Atlantic City. The company announced it had received an offer from an unnamed source, and is now waiting on approval from the other half of the Borgata ownership, Boyd Gaming. MGM will receive about $250 million cash in the deal, which calls for the buyer to take over half of the Borgata's $875 million debt load. So essentially the deal is worth $687.5 million which would value the whole Borgata property at $1.375 billion. Selling the Borgata allows MGM to chip away at their massive debt. It also means they will be out of New Jersey completely which will give them more freedom to operate in Macau. While the Borgata is a great property and the best thing in Atlantic City, MGM is probably happy to sell given the circumstances. 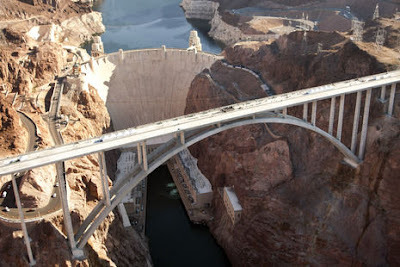 Construction on the Hoover Dam Bypass bridge is finally complete. A dedication ceremony was held on Tuesday commemorating the opening of the Mike O'Callaghan – Pat Tillman Memorial Bridge. The bridge will open to traffic within the next few days. The bridge should help traffic flow between Phoenix and Las Vegas now that drivers do not have to slow down to cross over the Hoover Dam. Traffic over the Dam will be suspended once the bridge is fully operational. 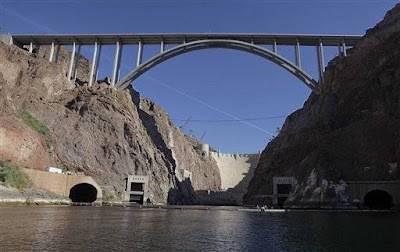 The 1,900 foot bridge sits 890 feet above the Colorado River and has a price tag of $240 million. Planning for the project began in the late 90's with approaching roads beginning construction in 2003. The bulk of the bridge construction started in 2006. A new zip-line attraction will be opening soon at the Fremont Street Experience. Riders will be able to traverse 800 feet of zip-line under the Fremont Street canopy going from a height of 67 feet dropping down to a 15 feet high landing area. This looks like a pretty cool attraction, and may be a good solution for thrill seekers who are too afraid, or don't want to pay $100 for the Stratosphere Sky Jump. Oktoberfest is back for another haunting season of freakish fun at the Fremont Street Experience. If ghosts and goblins aren’t enough to scare you, why not fly down "Frightlines” under the Fremont Street Canopy. Imagine being part of the Viva Vision show as you launch down a zip line that runs approximately 800 feet in length. The crowds underneath cheer as you zoom past on your broom from 67 feet dropping down to 15 feet at landing! For more information check out Fremont Street Flightline. 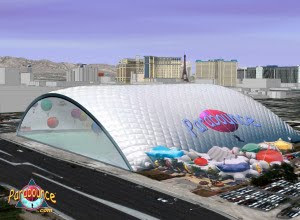 UPDATE: The temporary zipline on Fremont Street will be upgraded to a permanent structure called Slotzilla in 2013. Caesars Palace, Imperial Palace and Rio now allow guests with dogs to stay at their hotels. I'm a little surprised that Caesars would allow dogs especially at the Agustus Tower since that is a fairly new and nice tower, but I guess if the pets are contained to a specified area then everything would probably work out and other guests wouldn't be disturbed. UPDATE - January 2011: The Pet Stay program has now been expanded to include Caesars Palace, Paris, Planet Hollywood, Harrah's, Flamingo, Bally's, Rio and Imperial Palace. Please check with each hotel for details. Caesars Palace, Imperial Palace and Rio All-Suite Hotel & Casino in Las Vegas are rolling out the red carpet for traveling dogs, with the launch of "PetStay," the resorts' new pet-friendly hotel program. Guests participating in the PetStay program are greeted by several canine-friendly in-room amenities including a mat, food and water dishes, disposable waste bags and dog treats. Caesars Palace, Rio All Suite Hotel & Casino and Imperial Palace each host a designated PetStay area within the hotel, equipped with welcome packets that direct guests to outdoor relief areas and dog walking routes as well as specialty room service menus. Additional Information about dog-friendly items for purchase and nearby dog services (such as grooming, walking and veterinary care) is available upon check-in at each of the participating resorts. * Dogs staying at any of the three hotels must weigh 50 pounds or less and be present at the time of check- in. * Dogs are permitted to walk through designated common areas while on a leash and accompanied by the owner. Hotel room rates for owners traveling with a dog are competitively priced at a $25 per night upgrade for designated pet-friendly hotel accommodations in the Augustus Tower at Caesars Palace; a $20 per night upgrade applies to similar accommodations at Rio All-Suite Hotel & Casino and Imperial Palace. Source: Harrah's - Pet Stay Las Vegas. Gaming win on the Las Vegas Strip was up 21.09% in August 2010 compared to August of last year. Baccarat continues to carry the load for the Strip. Amazingly the amount that Strip casinos won on Baccarat was more than all of the other table games combined. It looks like the super high rollers were back on the Strip in August. If these numbers for Baccarat continue for the foreseeable future that would be a huge boost for the high-end hotels on the Strip. Downtown numbers weren't as good however, as they were down 1.41% year over year. It looks like things are improving in Las Vegas, especially on the Strip. Gaming numbers are improving and room rates seem to be creeping up. August Gaming Revenue Report and Win Revenue Summary. Penn National has bought the M Resort's debt, paving the way for the company to take ownership control of the casino. The Pennsylvania based company paid $230.5 million for about $860 million of total outstanding debt. Penn National has been looking to get into the Las Vegas market for a few years now. They own 23 casinos around the country, so they have a pretty big customer base to lure to a Vegas property. M Resort is probably a good place to get their feet wet in Las Vegas, especially considering they are getting a brand new property for a fraction of the building cost. Penn was a player in the auction to buy the stalled Fontainebleau project, but backed off in the later stages giving the property to Carl Ichan. They have also been long rumored to buy the Rio, but nothing ever came of that either. While the M Resort is a good start, there is little doubt that Penn National would like to have a property on the Strip. Perhaps they will look to expand further into Las Vegas after they fully acquire M Resort. 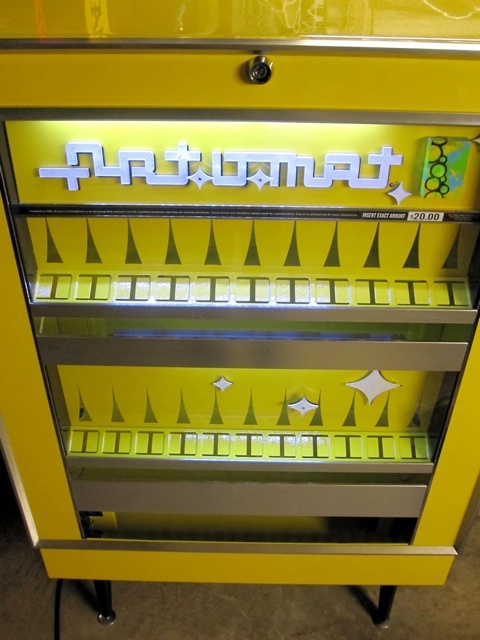 Who knows, maybe they will end up with Fontainebleau after all in a few years when Ichan decides to unload it. M Resort and a finished Fontainebleau would be a really nice foundation for Penn National to build on in the Las Vegas market. A few days ago it was revealed that most the the furniture at the stalled Fontainebleau project would be sold off at auction. Today a story in the Las Vegas Sun reported that much of that furniture was purchased by the owners of the Plaza hotel, which is scheduled to close for renovation this November. 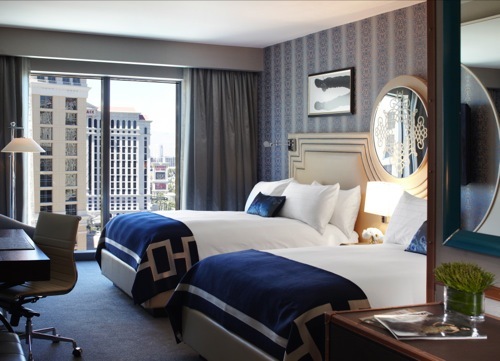 Plaza's newly remodeled rooms will be fitted with "Wallpaper, carpet, tile, sofas, chairs, desks, dressers, side tables and bed frames" that were originally intended to be used in the rooms at Fontainebleau. It appears the owners of the Plaza might actually be serious about renovating the property. When it was announced that the hotel was closing, many people speculated that this would be another Lady Luck or Binion's situation, where the hotel would close and not actually be worked on for a long time. It looks like this is not the case, as the project has a set budget ($20 million) and re-opening date (September 2011). Now they have some brand new swanky furniture to go along with it, purchased for pennies on the dollar. Following their successful Buffet of Buffets deal, Harrah's now has an "all you can see" show package. 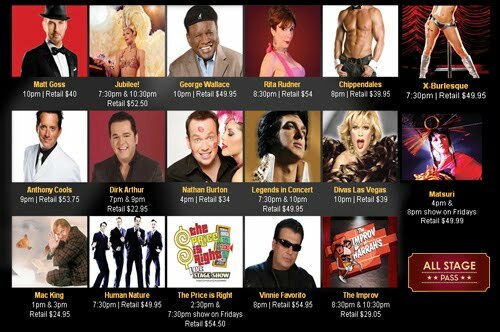 For $99 (plus taxes and fees) you can see as many selected Harrah's shows as you can for a 48 hour period. There are currently 17 different shows to choose from and the clock starts ticking as soon as you buy your pass. There are also "premium" shows that aren't included but you can pay $40 to see them during your 48 hours. Premium shows include Cher, Barry Manilow, Donny & Marie and Penn & Teller. It looks like Peepshow isn't included in this promotion even though you have to buy your pass at Planet Hollywood. This has the potential to be a great deal, but like the Buffet of Buffets deal it requires some planning. You pretty much need to see 3 or 4 shows to get your money's worth. This is definitely possible since there are a few afternoon shows to choose from, and you could theoretically see 2 shows in the same night as well (say a 7:30 and a 10:00). I like seeing shows in Las Vegas, but I'm not sure how I feel about trying to cram 2 or 3 shows into the same day. Another thing to consider is that the "retail" prices for many of these shows could be greatly reduced by using a coupon or discount ticket outlet. For example you might think you're getting $24.95 worth of show by seeing Mac King, but free passes or 2 for 1 coupons this show are often easily available. Similarly the retail price for X Burlesque is $49.95 but I've seen this show sold at the discount ticket brokers for under $30. If you are looking to see as many shows as possible on a budget then this is probably a great deal for you. If seeing 2-3 shows a day seems a little overwhelming, then using coupons or discount ticket brokers might be a better option. Source: Harrah's All Stage Pass. Please check them out for all the details. A food court at Flamingo will be opening this fall. Restaurants will include Johnny Rockets, Pan Asian Express, LA Subs & Salads & Bonanno's NY Pizza. The food court will be near the main showroom at Flamingo. I personally like the choice to add some fast food to the property. Previously guests would have to venture across the street to O'Sheas if they wanted to grab some food on the run. Flamingo isn't really known for its dining offerings, so this will add another choice for people who might not want to spend time sitting in a restaurant or waiting in line at the buffet. In a sign that the Fontainebleau project is dead for now, owner Carl Ichan held a garage sale of sorts, selling off assets from the hotel. Beds, chairs, couches, lamps, door moldings and just about anything else that wasn't nailed down was sold recently to the highest bidder at auction. I'm wondering why a hotel that was so far away from completion would have so much furniture. It seems that installing room furniture would be the very last step in completing a hotel, but apparently everything was ordered and ready to go via subcontractors when the project went bankrupt. I guess this proves that Ichan never really had any intention to complete the Font, and is just biding his time until he can flip the property for a profit. My prediction is that two years from now the strip will be almost fully recovered and Ichan will unload the blue elephant for about $300 million which translates into a 100% return on his investment. Not a bad deal. I still think that the property will open someday, but that date is getting pushed further and further back. I'm personally looking forward to a Fontainebleau / Echelon double grand opening party in December 2015. The nightclub at Cosmopolitan will be called "Marquee" named after the successful New York City club. Marquee will be operated by the Tao Group. The 63,000-square-feet indoor and outdoor venue will be open 18 hours a day, and is sure to become one of the hottest spots in Vegas once it opens in time for New Year's Eve. In other Cosmo news, Jay-Z and Coldplay will be performing for Cosmopolitan's grand opening New Year's Eve bash. No matter what you think of them, both Jay-Z and Coldplay are huge acts, and I think it's good for the city to have some high profile artists there for the opening of the new hotel. 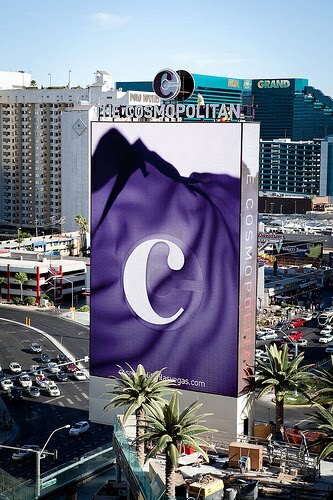 I don't remember if Aria / CityCenter even had any musical acts to open that huge project last year, so in comparison it looks like Cosmopolitan is doing a good job building some hype and anticipation for their opening. Cher's residency at Caesars Palace will be coming to an end in February 2011. She will be performing at the Colosseum from now through October, then taking a two month break and returning in January up until her final show on February 5th. The timing coincides with Celine Dion's return to the Colosseum at Caesars March 15, 2011. Dion will perform about 70 dates a year, and already has 50 dates booked through August. With Cher leaving and Celine only doing a limited schedule there have been rumors of possible headliners that will join the Caesars lineup for 2011. Neil Diamond and Madonna have been mentioned, but they both seem highly speculative at this point. Rod Stewart is also playing some shows at the Colosseum in November, so he might be a candidate for a permanent residency. A story has been making the rounds about the pool area at Vdara being exceptionally hot. It appears that the sun has a way of reflecting off the curved building and converging directly onto the pool area, causing temperatures to soar 20 degrees above normal. The buildings architects foresaw this problem somewhat and coated the glass with a film that was supposed to disperse the sun, but apparently this isn't doing the trick. The sun can routinely melt plastic bags and cups around the pool area. 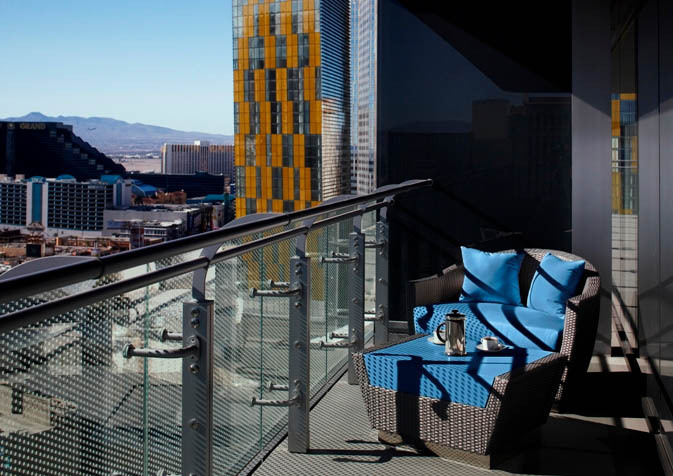 The hotel is planning on installing more sun umbrellas and planting some trees, but it is unclear weather this will be enough to protect visitors from what is being called the "Vdara Death Ray." I'm guessing with fall on its way there won't be many complaints for the next six months or so, but it will be interesting to see if this phenomenon remains when triple digit temps hit next summer. Here is a new song to add to your Las Vegas play-list. Brandon Flowers of The Killers has released a solo album called Flamingo, and the first song on the album is called Welcome to Fabulous Las Vegas. The song definitely has a Vegas feel and would be a nice addition on your iPod for the plane ride in. Wayne Newton has been making some headlines over the past couple of days. First it was reported by TMZ that he had his abandoned jet shipped to his house in Las Vegas and it is now being displayed on his lawn. Apparently the plane fell into disrepair a while back when Newton couldn't afford maintenance. The aircraft sat at the Detroit airport until the powers that be finally made him remove it. Secondly it looks like Wayne is trying to convert his famous Casa de Shenandoah estate into a tourist attraction. He held a meeting with his neighbors who were reportedly not happy with the possibility. Since the estate is in a residential area, Newton has to file paperwork to get a special use permit which he will likely do soon. The airplane story makes more sense now - he could use the plane as part of the attraction for tourists to check out. Hotel operations at the Plaza downtown will close on November 11th. The casino will remain open, along with the popular Firefly restaurant and Rat Pack is Back show. The official word is that the hotel is closing for renovations and will re-open in 2011 with the new name Union Plaza. Unofficially though many people are wondering if the remodeling will be done and how soon. It might make more economic sense to just leave the hotel closed for a while until things turn around a little bit. With rooms downtown as cheap as they are the hotel portion of the revenue can't be that substantial. Unfortunately the closure means the loss of 400 jobs. The Plaza's parent company will try to place some of the employees at their other hotels (Las Vegas Club and The Western) and will also try to re-hire them if and when the hotel re-opens. It will be interesting to see how well the planned renovations go, along with the planned renovations over at Lady Luck. If things go as planned, downtown visitors could have two new fresh hotels to choose from in 2011 and 2012. On the flip side there's a pretty good chance that things will be put on hold indefinitely, which would be another negative development for downtown. 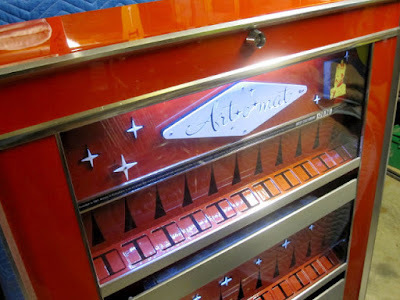 The once popular Liberace Museum is closing it's doors on October 17th. The museum was in operation for 31 years. Plans are underway to maintain the memorabilia at the museum and turn it into a traveling exhibit. I'm kind of sad to see this go. I had never been in the place but driving by I always thought it looked interesting, and had the kind of glitz and glamor that Las Vegas represented. I wonder if the memorabilia will be making an appearance on the Strip at one of the hotels. An exhibit there might make more sense than a standalone museum. The Real World is rumored to be returning to Las Vegas for its 25th season. This time the MTV reality show will be located at the Hard Rock. In 2002 The Real World put the Palms on the map when the show was located in a penthouse suite at that hotel. The success of that show led to the Palms becoming a hot spot for the 20-something Vegas club crowd. This should be a mutually beneficial relationship between MTV and the city of Las Vegas. From what I understand the show's ratings have been a bit down recently, and so having it in a city like Vegas could boost that a little. On the other side having Las Vegas in a popular TV show will definitely create some buzz and might expose Las Vegas to the younger MTV viewers. Source: MTV Real World News Blog. With Lance Burton's run at the Monte Carlo coming to an end, the hotel has replaced him with dance troupe Jabbawockeez. The Jabbawockeez show will be titled "Mus.i.c" (pronounced "muse I see") and starts Oct. 7, with five shows per week through December. The troupe had a successful run at the MGM Grand earlier this year, which prompted MGM Resorts International to bring them back "by popular demand." Lance Burton hasn't announced any plans yet, but I wouldn't be surprised to see him back on the Strip eventually. Source: AP via Yahoo News. Dubai World, the 50% owner of CityCenter might be looking to sell its share of the property. According to a Reuters report, the company has shown a willingness to sell off core strategic assets in order to reach a re-structuring deal with creditors. Dubai World paid $2.2 billion for a 5.9 percent stake in MGM in October 2007 and $4.8 billion for an investment in CityCenter. Those investments are now worth a fraction of what they paid. Their stake in City Center is probably worth about a billion dollars now, while their shares of MGM are worth even less than that. While this news technically means that 50% of CityCenter is on the selling block, in reality it is unlikely a deal will be done anytime soon. Critics are saying that the sale of assets is unlikely and is only being talked about to appease creditors. Even if Dubai World was serious about selling CityCenter I doubt there would be any buyers in this market. 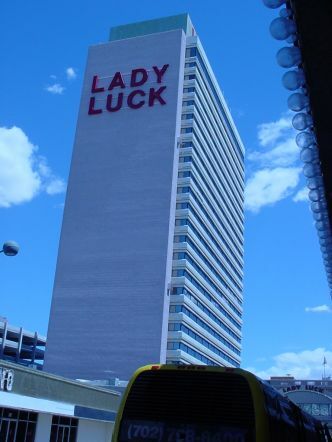 Las Vegas city officials have approved plans for the renovation of the closed Lady Luck Hotel. This brings the hotel one step closer to re-opening, which is scheduled to occur in 2012. I am still in a "Believe it when I see it" mode when it comes to this project, but construction work is reportedly going to start immediately so if that happens I'll be convinced that the plans are legit. Rumjungle nightclub at Mandalay Bay closed earlier this week after a two year long battle with Mandalay over terms of their lease. Mandalay claimed that Rumjungle was short on rent payments, while Runjungle claimed that Mandalay's opening of their "eyecandy sound lounge" violated the original terms of the lease which stated that Rumjungle was to be the exclusive nightclub in the property. Finally the court sided with MGM / Mandalay Bay and the club was evicted earlier this week. It is likely that Mandalay will fill the space with a restaurant or lounge. The Sun is reporting that some renovations are being planned for the downtown casinos owned by the Tamares Group. The biggest changes will come at the Plaza, where a $20 million loan is being negotiated to makeover the hotel rooms. The hotel name will also be changed to Union Plaza, which was the original name of the hotel when it opened 1971 in reference to the Union Pacific railroad station that originally stood at the site. 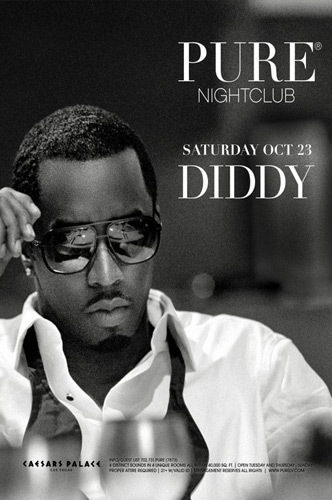 Lesser changes will be seen at Las Vegas Club, which will see "theme changes". The infamous Western casino on East Fremont will also get some new slots if things go according to plan. Any investment to improve hotel rooms is a winner in my book, especially downtown. The only question is whether the planned renovations will make a difference. The $20 million being spent on the Plaza is a fraction of the $165 million being spent on the Tropicana, or the $90 million outlay by Wynn to remodel their 5 year old rooms. Obviously the Plaza is smaller than those two, and being downtown they can probably spend less and get away with it, so we'll see how it goes. You might have seen this AT&T commercial. It's definitely in heavy rotation on certain channels. I was looking for it on youtube so I could catch a closer glimpse of what the Strip looks like with these fake orange cloths draped over the buildings. The National Football League is now going to allow Las Vegas advertisements on NFL TV broadcasts. Previously the league had banned Las Vegas advertising during games. The commercials will still have to fit a strict criteria though as references to gaming, specific hotels, and potentially suggestive ads (like the What Happens Here Stays Here campaign) are still banned. The NFL gave Vegas commercials a trial run during the 2010 playoffs and it was apparently successful enough to allow the advertising to continue into this regular season. While I can understand why the NFL wouldn't want to advertise gambling, many have pointed out that they have no problem advertising products like alcohol and Viagra (although they do ban certain other products). Either way Las Vegas is much more than gaming nowadays so I don't think the restrictions will hinder the overdue marketing of the city on NFL broadcasts. It should be a win-win for both Vegas and the NFL. The Cosmopolitan marquee was turned on yesterday. The 65 story marquee is the only one on the Strip to feature a four sided video board with "full bleed" video on all four sides. Personally I think the video board looks pretty cool. The four sides are a nice touch, and the video looks to be really high quality. I think it does a good job of fitting in with the hotel's image. It's modern and a little flashy without being over the top. Cosmo CEO John Unwin and Brand Marketing SVP Lisa Marchese were on hand to turn on the lights of the marquee. 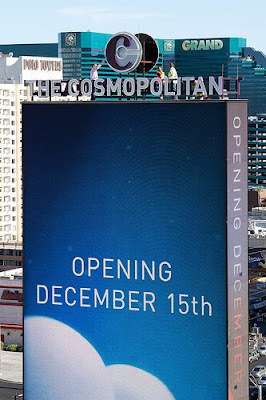 Check out more photos of the marquee at Cosmopolitan's Flickr. It was revealed today in the MGM Resorts International 2nd quarter earnings report that CityCenter is now valued at 2.65 billion dollars. This represents less than 1/3rd of the cost to build the complex which has been quoted at $8.5 billion. In other CityCenter news, occupancy was 80% at Aria for the second quarter with the average room rate of $178. This is higher than the 63% that was reported in the first quarter, but was likely the result of slashing the room rate - which was $194 in the first quarter. If MGM wants Aria to reach a 90%+ occupancy rate they will likely have to reduce the rates a bit further, or wait until business picks up (which is unlikely considering Cosmopolitan will be adding a ton of rooms to the supply chain in December). Source: MGM Resorts Press Release. Popular restaurant Hash House A Go Go will be opening its third Las Vegas location at the M Resort in October. The off-Strip restaurant recently expanded to the Strip with an Imperial Palace location, and will now replace the closed Red Cup Cafe at the M Resort. 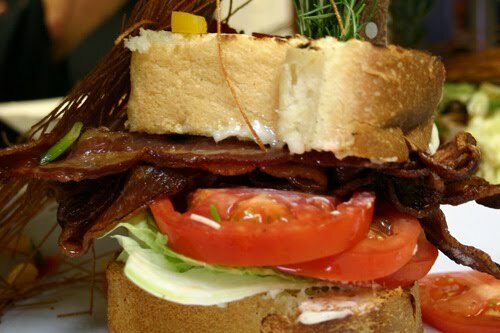 Hash House is known for huge portions of what they call "twisted farm food". I haven't been, but it seems like the place has gotten consistently good reviews, so it's definitely on my list of places to check out. Source: M Resort Press Release. Photo: Hash House Photo Gallery. A second Minus 5 Ice Lounge location will open at Monte Carlo in the space currently occupied by the Lance Burton Magic Shop and an MGM Mirage Players Club kiosk. The first Minus 5 in Vegas is at Mandalay Bay. Minus 5 is a bar which is made up entirely of ice. Before entering you are given jackets, gloves and boots to wear. It's $25 to get in, and that includes 1 drink. I seem to remember there being a time limit that you could spend in the bar, but I'm not sure if that still exists. I can't imagine people hanging around very long either way. When the first location opened I was wondering how successful they would be. The overhead must be insanely high, and the bar is pretty small, but apparently they are doing well enough to open a second location. I've never been there but it's probably worth doing once for the experience. They also have some pretty cool specialty drinks, including some named after Las Vegas Celebrities. 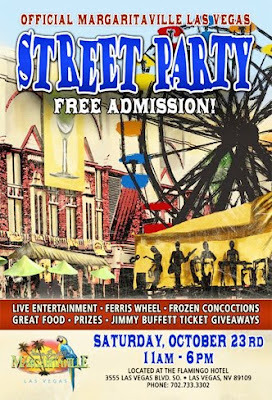 Back in July 2009 Harrah's revealed that they were planning on transforming the street between Flamingo and O'Sheas into a pedestrian walkway consisting of bars, restaurants and shops with a giant Ferris wheel at the end of the street. 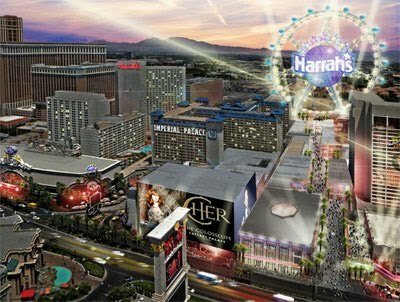 A year has gone by, and many people had forgotten about the project until a recent Business Week article confirmed that Harrah's is still aiming on building the development in 2011. The cost of the project would reportedly be less than $1 billion. I love the idea of turning the street into a pedestrian only street. It's a hassle to cross that street at times, and big crowds can build up near O'Sheas and in front of Margaritaville. Having the street pedestrian only would clear up that congestion and make the whole area a lot safer and more convenient. Having lots of bars and shops all together sounds like a good idea, but they will need to attract some pretty unique places to entice people to wander down the street. Hopefully they'll have some cool joints and not just an extended O'Sheas food court. Lastly, I don't really like the Ferris wheel idea. They need an attraction at the end of the street to get people to walk down there, but I'm not sure a Ferris wheel is what people want in Las Vegas. I could be wrong though, as the London Eye seems pretty popular, and people are always looking for great views of the Strip. Clark County has approved the project and new renderings have been revealed. See them here. 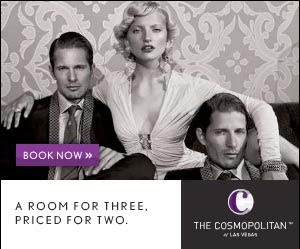 Cosmopolitan is now accepting room reservations. Rates are pretty much in line with what I predicted the other day. Weekend nights start at $190 with the average around $240. Midweek prices start at $125 a night with the average somewhere around $160. Of course these are standard rack rates, better deals and specials are likely to appear as the opening date approaches. 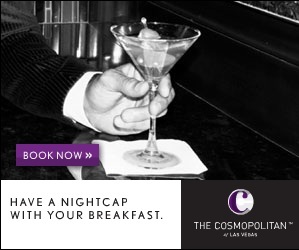 The Cosmopolitan has a few different room types to choose from. City Room and Terrace Studio are the entry level. Those wishing for more space can opt for the Terrace One Bedroom, Terrace Suite or Terrace Wraparound Suite. Since Cosmo was originally meant to have mostly condo units, the "Terrace" offerings include a fridge and microwave. Of course they also have the terrace balconies, which are unique for a Vegas hotel. I'm sure the balconies will be a big draw for people who want to have a nice view overlooking the Strip. We still have half a year until the opening, but it looks like everything is coming together nicely. Lady Luck is targeting a late 2012 re-opening date. The renovation project was approved by the Las Vegas Planning Commission and will presumably be approved by the Las Vegas City Council in July. About a month ago I wrote about Lady Luck's re-opening plans. At the time I didn't think it would take two and a half years to complete the project. Thinking about it more though it makes sense. They are basically re-building the entire hotel which would be akin to starting new construction. The 2012 date assures me that they are being realistic with the plans, although it will be hard to believe anything is being done until construction actually starts. 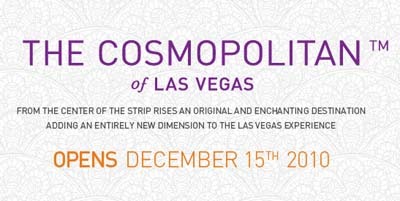 We had previously known that The Cosmopolitan of Las Vegas would be opening in December. This week the hotel announced the official date as December 15th. They posted this information on their facebook page. The Cosmo will start to accept reservations any day now. It will be interesting to see what type of rates will be offered. Considering most of the hotel rooms were originally meant to be sold as condo units they are probably larger than the average Vegas room. Also most (if not all) of the rooms will have balconies which is rare in Las Vegas. So what will a condo style room with balcony at the newest hotel on the Strip which just happens to have a great location cost? I'm going to guess the average standard rates will be around $250 weekend and $150 midweek. This would put it more or less in-line with Aria. I think they might even be able to get away with charging a little more than Aria because of the (slightly) better location and presumably larger rooms. Max Brenner Chocolate will be opening in the Forum Shops at Caesars Palace later this summer. They serve upscale bar food but the main attraction is the wide assortment of chocolate offerings. Chocolate waffles, chocolate fondue and chocolate pizza are some of the specialties. Looking at the menu this looks like a can't miss for Vegas. Is there better time to binge on chocolate than when you're on vacation in Sin City? The fact that they serve real food including breakfast is an added bonus. Serendipity 3 and their frozen hot chocolate has been a pretty big hit for Caesars, and I predict this will follow along that same path. Check out the Max Brenner website for more information. Eating Las Vegas is reporting that Hubert Keller's Fleur de Lys restaurant at Mandalay Bay will close in August. It will re-open later in the year as a tapas bar. Keller and his staff will remain at the new restaurant. Tapas is becoming a huge trend in Vegas. Many have attributed this to the economy. People are willing to spend a little on appetizer type dishes rather than going for the full dining experience. Personally I'm not a huge fan of the concept. It doesn't really feel like a full meal, and you end up getting so many different things that it can get quite pricey. I like Hubert Keller's Burger Bar though, so I might have to give the new joint a shot if given the opportunity. Luxor comedian Carrot Top was hospitalized earlier this week due to food poisoning. He had to cancel one show, but it looks like he's fine now. It was food poisoning and the resulting dehydration that made him drive himself to the hospital. Fluids were put into his system for a few hours, and then he was released. Good to see that he's doing ok, and hopefully he'll stay away from the Imperial Palace Buffet from now on. Fontainebleau Showing Signs of Life? The Las Vegas Sun is reporting that construction permits have been issued for the formerly named Fontainebleau project. The paper was quick to note that this doesn't necessarily mean construction will start anytime soon, but hey it's something. Carl Icahn acquired the project in bankruptcy court proceedings in January. Since then there has been much speculation as to what he will do with it. Many people said he would just let it sit until the economy improves. I agree that he wouldn't want to open a new casino in this environment, especially with CityCenter and Cosmopolitan soaking up the already saturated market. The thing is, Fontainebleau (or whatever it will be called) is going to take time to finish. I'm guessing that they are looking at 18 months minimum before they could open. If they start construction now maybe the economy will be at least slightly recovered by the time they are done in late 2011 or early 2012. They would also get to be in the spotlight as the newest hotel in town since CityCenter and Cosmo will have long been opened by then. I really hope something happens soon. That building is too big to be sitting there half finished, and that part of the Strip could use some good news. Paris is making some changes to the front of the hotel on the Strip. What used to be a fountain is now being transformed into a Sugar Factory store. Sugar Factory is an upscale candy shop. They have locations at Mirage and Planet Hollywood. The thing that strikes me about this project is the amount of space that will be taken away from the sidewalk. This is a very busy area of the strip and what once was a wide area for walkers to move will now be pretty narrow. Hopefully this spot won't turn into a pedestrian bottleneck similar to the sidewalk in front of Margaritaville. MGM Mirage officially changed their name to MGM Resorts International today. They also unveiled a new website. The move had been proposed for some time but was just approved by shareholders. People have been speculating that this means they are selling The Mirage, but I believe this speculation to be unfounded. The majority of the ESPN Zone restaurants are closing, including the one in Las Vegas at New York New York. It will be interesting to see what will now occupy the ESPN Zone space. I think it would be a good opportunity for NYNY to expand their sports book. Lagasse's Stadium over at Palazzo seems to be pretty successful as a restaurant / sports book hybrid, so perhaps they will try something like that. The ESPN Zone space is prime property right on the strip, so there are a ton of options. I stumbled upon the ABC reality show "True Beauty" last night. The contestants on the show think that they are on a show called "Face of Vegas" where they are auditioning to become a spokesperson for the city of Las Vegas. In reality they are being secretly judged on their character along with their real spokesperson skills. The show is pretty much mindless reality fare, but it is chock full of Vegasy stuff. The majority of the show takes place at Planet Hollywood (does every Vegas show or movie take place there? ), and in the episode I watched they were hanging out at some pretty noticeable landmarks, including the pool and the CHI Showroom. Penn and Teller made an appearance which is always a plus. Establishing shots of the strip were also plentiful. The show is nothing special, but I will probably continue to watch because of the Vegas scenes alone. You can watch full episodes online at ABC.com. The 2.16 acre parcel of land on Harmon Ave. south of Planet Hollywood and across from Cosmopolitan and CityCenter is being developed. A 3 story, one hundred thousand square foot retail building will break ground in the next few months. Walgreens will be the "anchor" of the building. It's definitely nice to see something done with this land. If you have walked past it lately you might have noticed that it is pretty barren and often trash laden. A Walgreens might not be what people expected, but this is a high traffic area, and Walgreens will no doubt do a lot of business. This will be the third Walgreens on the strip. There is one in front of Palazzo and another one just south of this proposed location near MGM Grand. I always think it's an interesting decision to not include a casino in a new project on the strip. It seems like it would be ideal to develop this land into a small walk in casino similar to that of Casino Royale, O'Sheas or Bill's. You could incorporate a Walgreens into that type of project and still print money from the casino. Obviously there would need to be significantly more investment and planning involved for that type of project though, and perhaps the economy can't handle it yet. Movies and TV shows like to take creative license when filming in Las Vegas. The NBC show "Las Vegas" was famous for their fictional hotel which seemed to change locations up and down the strip every episode. In the movie 21 the characters had a suite at the Hard Rock (off the Strip) that seemed to magically overlook the Bellagio fountains. The iconic Vegas movie Swingers had the characters entering the Stardust, but the interior scenes were actually shot at the Fremont hotel. The Hangover actually did a pretty good job with their Vegas exterior shots. I love the scene where they are overlooking the strip from Caesars and then night fades to day focused on Flamingo and Bally's. Earlier today I saw the new release Get Him to the Greek. Aside from looking like a reasonably funny movie, I heard that part of the film was in Las Vegas, which was an added incentive to see it. Turns out the Vegas scenes are kind of minor. The characters have a suite at Planet Hollywood. They then see the Rat Pack is Back show at Plaza. After that they are partying in another suite which I guess is supposed to be their original suite at Planet Hollywood. The only problem is the view overlooked the strip from a vantage point which looks south from Trump. The characters then exit the hotel and appear to be around Fashion Show Mall, which makes sense... but then the camera cuts and they are suddenly in front of Paris going north. I'm sure 99% of the moviegoers wouldn't notice this, but it was a pretty obvious goof for Vegas geeks to spot. So bottom line, Get Him to the Greek was a pretty funny movie, but if you were going for the Las Vegas scenes you might want to wait for DVD. Details of the Tropicana renovations continue to trickle in. Recent developments revealed that the hotel will be aiming for a South Beach Miami motif. The finished product scheduled to be complete by 2011 will include a Gloria Estefan inspired show and the Nikki Beach club. Doing some quick and probably inaccurate math, I calculate that the Tropicana would need to command about a $30 per night room rate increase over the next 10 years to equal the cost of the $165 million renovation. That should be attainable. If they are getting an average of $50 a night now (just a guess) for an outdated room, it shouldn't be that hard to get $80 for a brand new one. And this isn't even considering added gaming and other revenue which is bound to increase with a higher end clientele. I've said it before, but good move by the Trop, and I hope it works out well for them. The much awaited Encore Beach Club opened Memorial Day weekend. The front part of Encore transformed into a pool and surrounding cabana balconies. It even has a few blackjack tables tucked away from the main action. The Las Vegas pool party "daylife" concept is a big trend, and EBC will satisfy the high end of this market. From what I have read about the opening the crowd was pretty similar to that of the most popular trendy day clubs like Wet Republic and Liquid. It will be interesting to see if the upscale pool trend continues. Like the gourmet burger trend I wonder if this niche is becoming over saturated. The Las Vegas economy must be recovering. Plans have been submitted to remodel and reopen Lady Luck. The downtown property near Fremont Street has been closed since 2006. 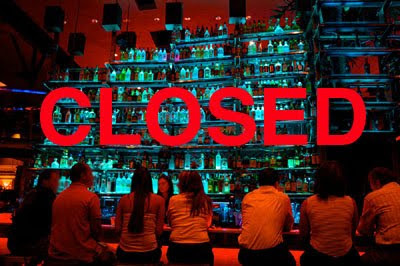 It was only supposed to be closed for 1 year, but has remained closed and many people predicted that it would never reopen. Mayor Oscar Goodman has been pushing for something to be done with the property. The plans call for putting a pool and deck atop the casino building, replacing 50 rooms with spa, fitness and meeting facilities, and upgrading the remaining 684 rooms. A pedestrian bridge linking hotel towers across Third Street will also be renovated. A renovated hotel downtown would be very successful in my opinion. There are probably lots of people (myself included) who would like to stay downtown, but don’t want to stay in an ancient hotel room. Golden Nugget has new rooms in their Rush Tower but they might a little overpriced. If Lady Luck opens with nice new rooms, with a new casino they could do very well. Adding a pool will also be a great asset. I'm not 100% sure, but I don't think many hotels downtown have pools (I know Golden Nugget has a nice one), so a great resort style pool downtown would be a huge draw. Source: AP via Reno Gazette-Journal.